Who could resist "Storybook Lane", a free comic book for the kids, a "modernistic concession stand", and the appeal of Toto the Clown, whose most popular costume is that of a tramp? Who was T. Texas Tyler, besides being the "man with a million friends"? The answer is here at CMT.com. The Airview was located near both the Tulsa Municipal Airport and Spartan School of Aeronautics. 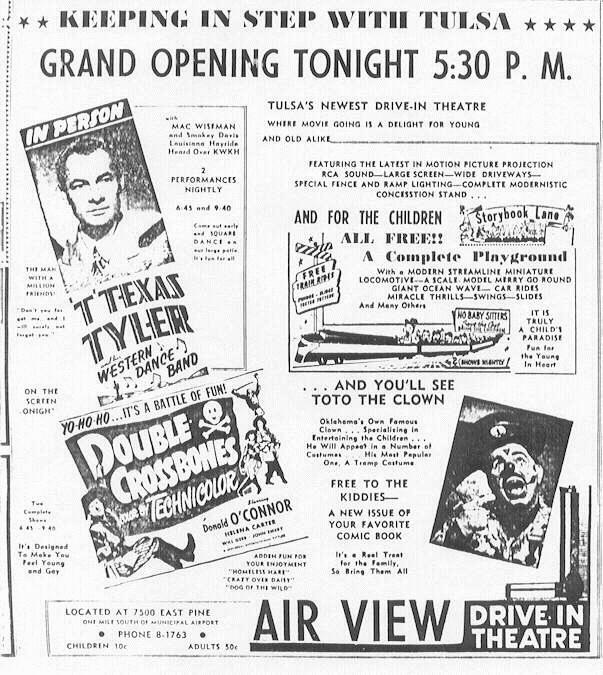 Grand opening June 7, 1951. 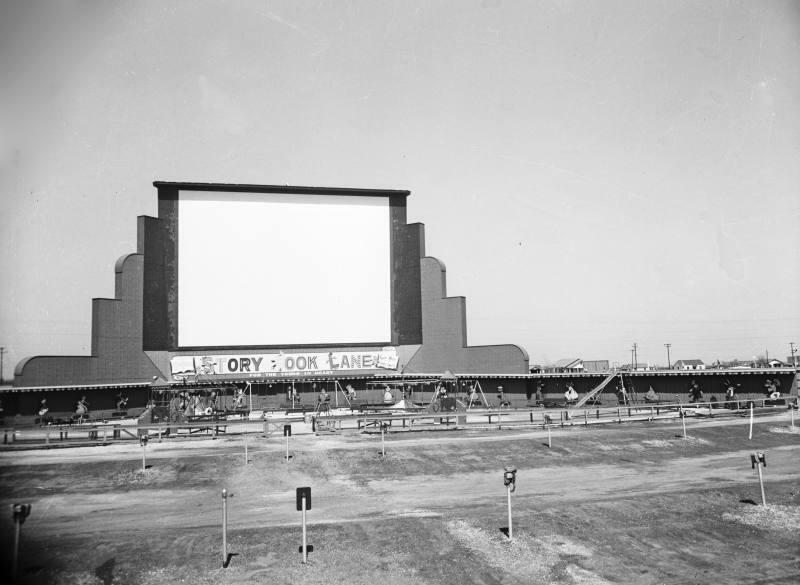 Operated by Griffith Theatres from June 7, 1951 until Aug 10, 1981. 1965 IMPA lists capacity as 700. 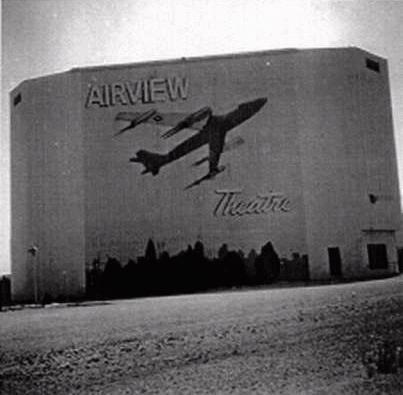 Here is the entrance and marquee of the Airview at 7500 E. Pine St. 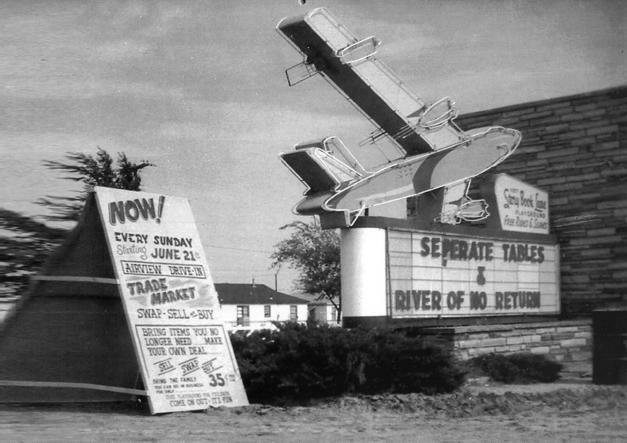 This shot is no earlier than 1958, based on the release date of "Separate Tables"; "River of No Return" was a 1954 movie. 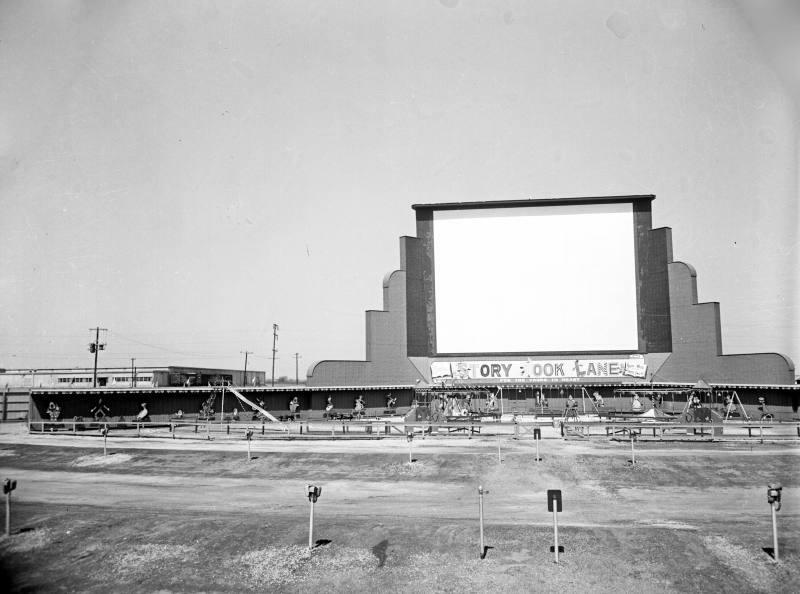 This image is from the Tulsas Olde Movie Theatres 2005 calendar, which features high-res b&w photos of numerous Tulsa theatres of the past, plus loads of info about Tulsa movie history. Some of my own movie tickets can be seen in one corner of it. 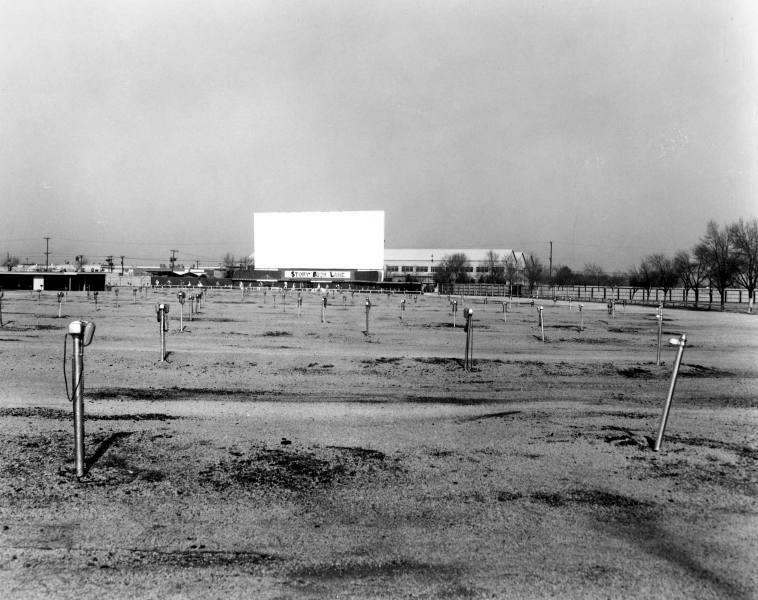 I absolutely loved going to the Airview Drive-In; the last movie I saw there was this absolutely worthless martial arts gem "Kill or Be Killed" in October 1980  2 years later, the Airview gets scrapped; I sure miss it and would give anything to have it back! Is this the Airview? The screen looks totally different, but there is a Story Book Lane as promised in the above opening night ad. I can confirm that the photos are indeed of the Airview. The third photo on the page, with the widened screen, also shows the Jorgensen Steel plant behind it, on the north side of Pine Street. That building is still in place. You are correct in assuming that the "Storybook Lane" we see in the photos is the same as the "Storybook Lane" advertised above the Airview marquee. Having visited Storybook Lane in my childhood, the photos bring back wonderful memories. I believe the first movie I ever saw was at the Airview, and it was one of the all-time greats, of course: "Have Rocket Will Travel," featuring the Three Stooges. I lived about a block away from the Airview, at a poor viewing angle. From my back yard you could see the screen and could see light and color when a movie was being shown, but the view was only a sliver. Red spot at right marks Stacy's house near the Airview. 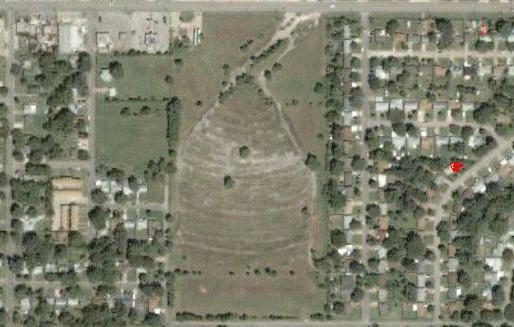 Land undeveloped as of 11/2005. (from GB 284, 2/25/09) Stacy: it will become a DHS facility for foster children awaiting placement. The screen looks different. What happened to the elaborate art deco embellishments? Was this later than the shots above?